Venus is the second closest planet to the Sun and it is named after Venus the Roman goddess of love and beauty. It is often called Earths twin planet because in many ways Venus is very similar to our own planet. Venus is of a similar size to the Earth, similar gravity and is made from similar materials as the Earth. In other ways Venus is very different from the Earth because it is not a hospitable environment. Temperatures can be extremely high on the surface of Venus and there is very little water present on the planet. Venus’ atmosphere is much thicker than that of the Earth and until recently we have been unable to penetrate through the atmosphere to see what the surface of Venus is like. It was first thought that Venus could house tropical jungles until US and Russian spacecraft managed to view Venus up close and by penetrating through the thick gas clouds their spacecraft instruments could detect the high temperatures and dense atmosphere which showed that nothing could survive in such an extreme environment. Here are some more detailed facts about the planet Venus. Venus has a very similar size and mass to that of the Earth – Venus is only 650km smaller than the Earth and its mass is 81.5% of the Earth’s. The atmosphere is 96.5% carbon dioxide with most of the remainder being nitrogen. 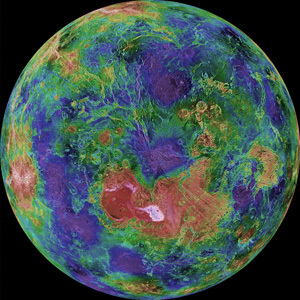 Due to the large carbon dioxide levels in the atmosphere, Venus creates that largest greenhouse effect in the solar system which means that temperatures on the surface of Venus can reach 420 °C. This makes Venus the hottest planet in our solar system – hotter than Mercury even though Venus is twice as far away from the Sun as Mercury. Hubble image of the planet Venus. Colorised to emphasise smaller features. Venus is first documented by the Babylonians in 1581 BC and was referred to as the “bright queen of the sky”. Venus does not have any moons. Venus is 108 million kilometres away from the Sun and completes a full orbit every 224.65 days. Venus is second only to the moon in terms of being the brightest natural object in the night sky. It is bright enough to even cast shadows! Venus is sometimes known as the Morning Star or Evening Star because it is at its brightest just after sunset and just before sunrise. When Venus’ orbit takes the planet directly between the Earth and the Sun, Venus gets closest to the Earth of any other planet at a distance of approximately 41 million km away. Due to the reflective clouds of sulphuric acid that surround Venus it is not possible to see the surface of Venus from space. The surface of Venus is largely made up of smooth volcanic plains, approximately 80%, and these are what have shaped the surface of Venus. There are 167 volcanoes on the surface of Venus that are wider than 100 km each. Only one volcano is this large on the Earth, this being in Hawaii. It is estimated that Venus is 4 billion years old and the surface of Venus is 300-600 million years old. The surface is younger than the planet itself because it was constantly changing due to volcanic activity. Due to the constant volcanic activity on the surface which remoulds the surface of the planet there are few impact craters on Venus that remain. Studies have indicated that several billion years ago, Venus had an atmosphere similar to the Earth and that there was likely an abundance of water on the surface of Venus. However, the greenhouse effect on the planet over the years caused the formation of greenhouse gases and the evaporation of water which has led to the hostile surface environment on Venus of today. Venus goes through “phases” similar to the phases our moon goes through. When Venus is viewed through a telescope and the planet is at its closest (and brightest) you will see a crescent shape, but when Venus is further away the planet will appear to be more circular in shape. 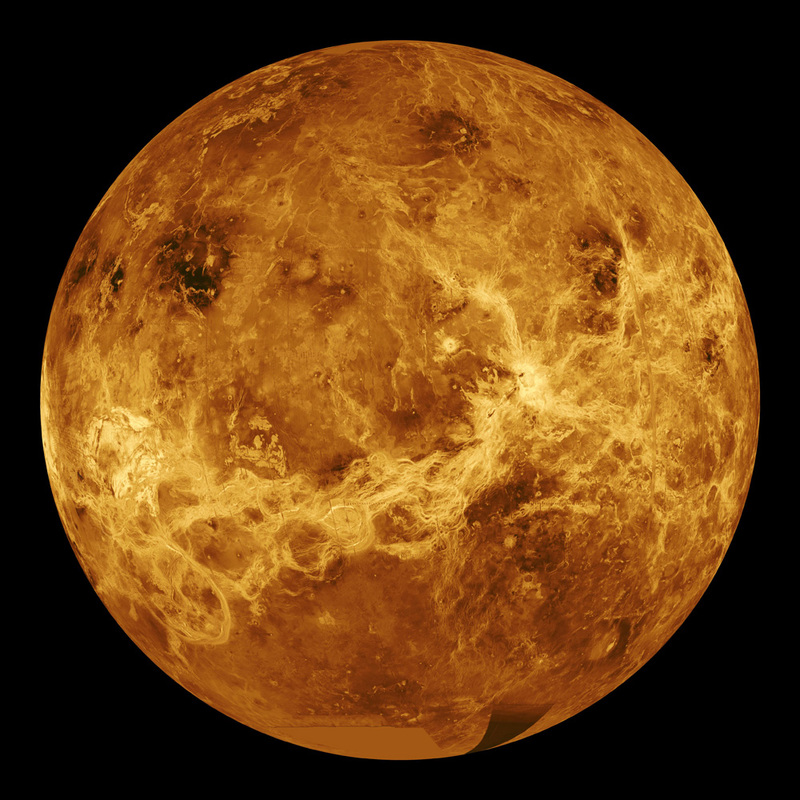 The temperature on Venus remains at a similar level whether it is day or night or at the equator or the planet poles. Venus has the least eccentric orbital path of any planet. This means that the orbit Venus takes around the Sun is closest to circular of any planet in the solar system. 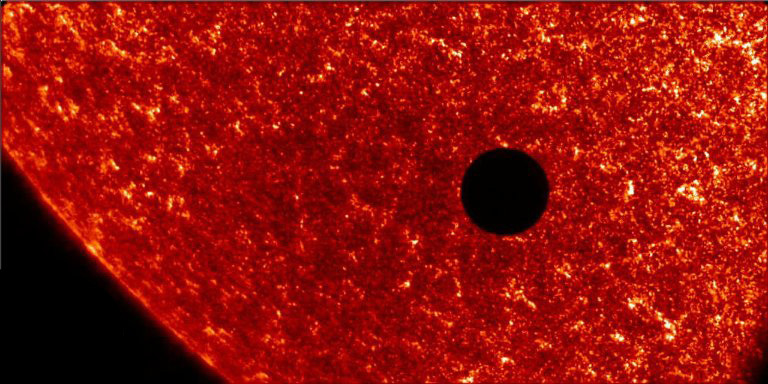 Venus in transit in front of the Sun. Venus rotates once after 243 Earth days. This is by far the slowest rotation of any of the major planets. The time it takes from sunrise to sunset on Venus is 116.75 Earth days. Both the US and Russia have sent spacecraft into space to study Venus. Russia began with the Venera program in 1961 and the US with the Mariner probes in 1962. The Venera 3 probe was the first spacecraft to crash land on any other planet when it landed on Venus in 1966. Unfortunately the communication system failed before it was able to send back any information from the planet. Venus is the only planet in our solar system to rotate backwards. In other words, Venus rotates clockwise, but all the other planets rotate anti-clockwise. Even though the surface of Venus is far too hostile for us to survive using our current technology, at 50 km above the surface of Venus the atmosphere of Venus is the most like Earth in the whole solar system. This means that there is a future possibility of us colonising Venus by building floating cities in the Venusian sky far above the surface of the planet.